Unique and extremely usable, the Bike Peddler Take A Look Cycling cyclist's mirror easily fits on helmet visors and eyeglasses. With three pivot points for maximum adjustment, the mirror face is adjusted by rotating it at a 90-degree angle from the wire. The mirror rotates fore and aft for fine angle adjustments. An ideal tool to keep an eye on traffic approaching from behind, the frameless acrylic mirror provides a wide, uninterrupted field of vision. 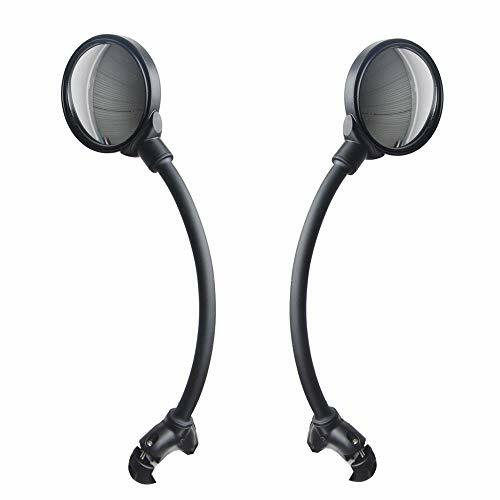 For added adjustment, the mirror is designed to fit on both the right or left side, and its 3-point attachment system adjusts for a secure fit without vibration. Available in two sizes: compact, which extends 50 millimeters and has a mirror size of 20x37 millimeters (HxW) and normal, which extends 85 millimeters and has a mirror size of 28x37 millimeters (HxW). Made in the USA, this mirror is backed by a manufacturer's unconditional guarantee. Fixed base: applicable to tube diameter between 22-32mm, double screws fixiation could be adjusted, durable, secure clutch,with a protective soft plastic gasket inside to prevent falling off. We conducted a customer satisfaction survey and improved this bicycle mirror according to customer feedback. In order to broaden the field of vision, the diameter of the mirror was increased from 7.5cm to 9cm. ALL Customer Can Return And Get Refunded In Case The Purchasing is Not Satisfiled for any reason ,You have no risk to try. 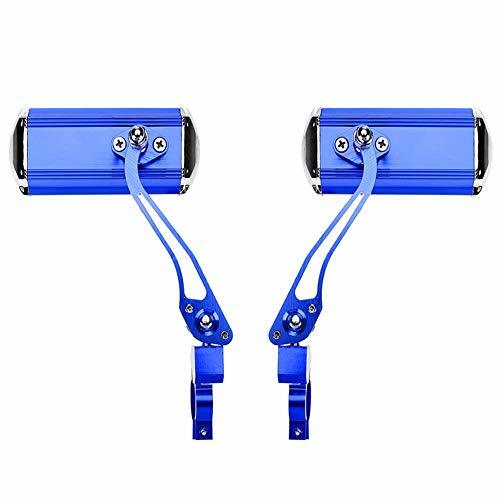 Universal Mini Rotaty Rearview Handlebar Glass Mirror For Bike Bicycle Cycling: Fast install and dismantle by a adjustable belt. Mirrors are adjustable with 360 degree rotation for better view. Compatible with 25mm-55mm internal diameter of the bar. Glass mirror dimension:2.5 inch x 1.7 inch (70mm x 50mm). EEEKit Pouch is provided for working as your moving pocket which you can find the camera and all the accessories right away in with no mess and miss whenever you need them. Size: 6.5x4 Inch. Kit Includes: 2 x Mini Bike Mirrors, 1 x EEEKit Pouch. 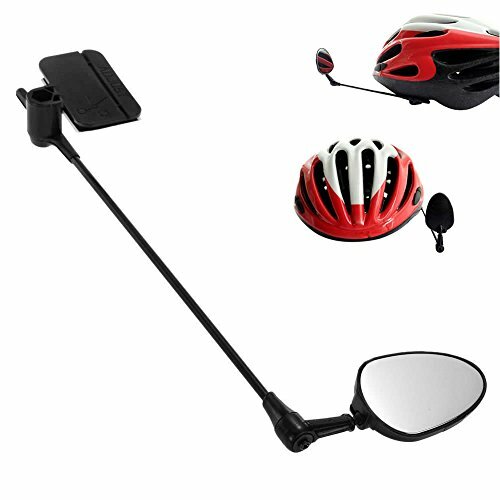 EEEKit Bike Mirror provides you the essentials when cycling. 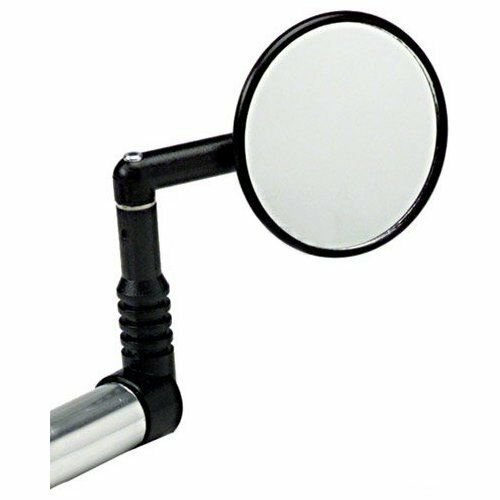 Universal Mini Rotaty Rearview Handlebar Glass Mirror For Bike Bicycle Cycling, fast install and dismantle with the tool in the kit. 360 degree rotate help you watch every direction of you back. Sometimes treat it as a mirror to check your face or cloth. Compatible with 2-2.2cm( 0.79-0.87 inch ) diameter of the bar. Mirror Diameter: Approx.7.5 cm (2.95 inch ). EEEKit Pouch is provided for working as your moving pocket, Size: 6.5*4 Inch. Meachow New High Quality Bike Mirror!! --High-Definition,Anti-glare and Anti-scratch coatings on lens,allowing you to see clearer and sharper images. CONVEX MIRROR: These mountain bike mirrors provide wide field of view and is adjustable to any angle for optimal viewing. 360 DEGREE ROTATION: Provide riders safe practical rear view options. Base is adjustable to 360 degree, while mirror comes with 180 degree plane rotation. FAST INSTALLATION: Each bicycle mirror is designed with adjustable buckle strap, fits handlebars of diameter from 15mm - 30mm. LIGHTWEIGHT AND PORTABLE: The portable nature of these bike glass mirrors makes them easy to use wherever you go and with whichever bike you need. 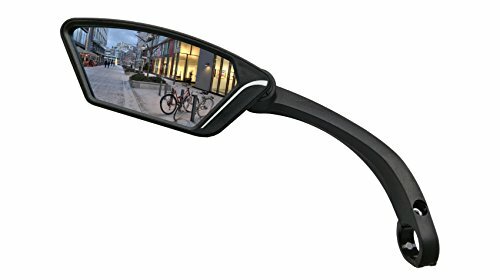 DIMENSIONS: Each bicycle rear view mirror measures 5.5 x 3.1 inches. Fits handlebars from 15 - 30 mm (0.6 to 1.1 inches) in diameter. 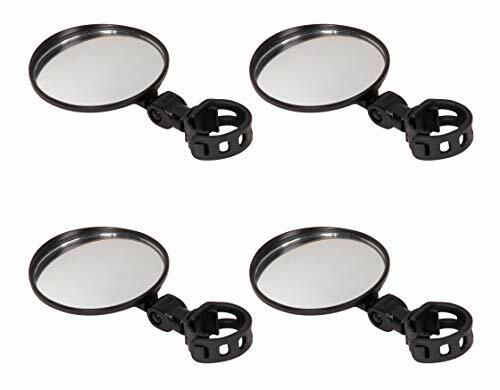 Description: 100% brand new and high quality Installed on the helmet, rotatable First choice for bike enthusiasts With velcro, you can adjust the angle of the mirror Mirror size: about 45mm x 30mm(approx) Length: about 22cm(approx) Rod material: aluminum Color:Black Quantity: 1pc(other accessories demo in the picture is not included.) Note: No retail package. Please allow 1-3mm error due to manual measurement. pls make sure you do not mind before you bid. Due to the difference between different monitors, the picture may not reflect the actual color of the item. Thank you! Under 3 months without use under 20 ~ 45 . Over 3 months fully discharge and store under 23 3 and humidity of 65 20 RH in a dry cool place. If you have any problems with our items or services, please feel free to contact us BEFORE you leave negative feedback. It is impossible to address isues if we do not know about them. ( ) Hi! Cool friends! Welcome to GoodPoint Art Store!!! Here, GoodPoint Art wish you have a nice shopping tour and happy everyday!!! The interior battery is Brand Cells 112 pcs battery cells made with the highest quality cells. No more clunky, heavy aluminium to lung around behind you- this battery is made of lightweight yet durable plastic that doesn't overheat with use. This battery's also made from lithium ion that keeps a charge and keeps its shelf life longer than lithium iron batteries that tend to die out quickly. 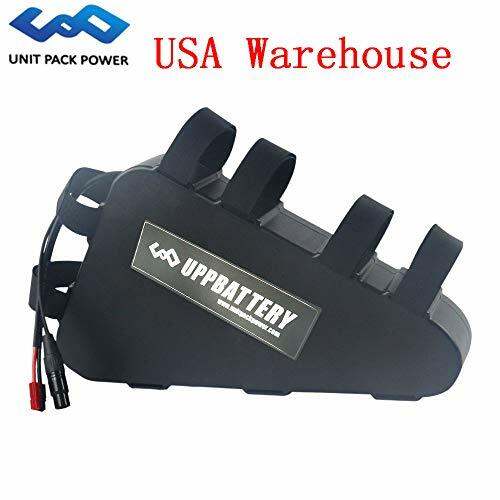 The interior battery is Brand Cells 104 pcs battery cells made with the highest quality cells. No more clunky, heavy aluminium to lung around behind you- this battery is made of lightweight yet durable plastic that doesn't overheat with use. This battery's also made from lithium ion that keeps a charge and keeps its shelf life longer than lithium iron batteries that tend to die out quickly. 1.Rectangle mirror provides wider view. 2.Constructed of shatterproof mirror and high-strength aluminium alloy material. 3.Compact design and easy installation. 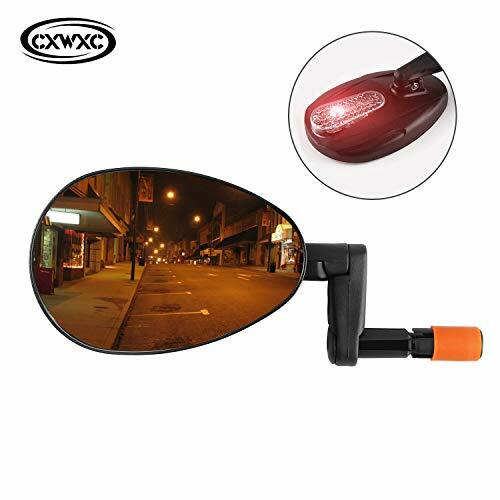 Compared with ordinary flat mirror, this bicycle mirror has a large convex mirror that shows you a wider view, so that you can see the road conditions behind you more clearly. The back of the mirror is equipped with safety warning lights. You can switch the light to the continuous lighting mode and the flashing mode by pressing the switch. 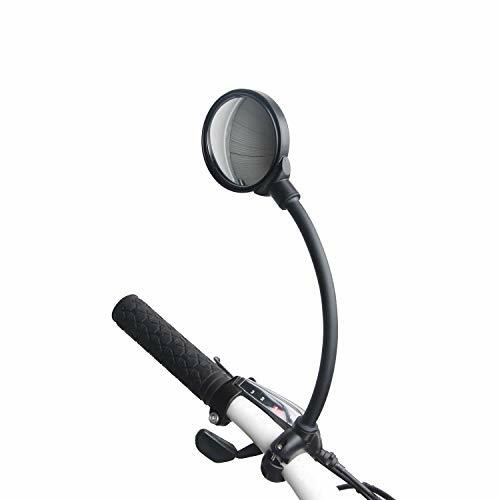 Both the bicycle mirror and the frame support 360-degree rotation and can be adjusted to the right angle at will. The frame made of high impact nylon fiber, suitable for most bicycles with inside handlebar diameter of 16.5 mm to 22 mm (0.64 in - 0.86 in). 2,Putting the handlebar clamp to the right position, then use the wrench fasten it. 3,If you find the position is not so suitable, you can loosen it again, when adjust it to the most suitable position you want, then tighten it. 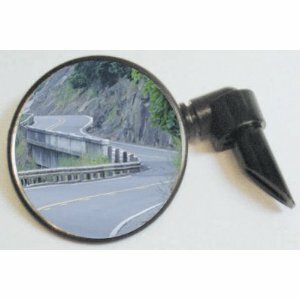 Ensure Your Safety First This unique bike rearview mirror is designed to give you clear visuals of the road conditions behind you to help keep you safe from road accidents.Bicycle Rear View Mirror Acrylic CONVEX mirror,diameter 7.5cm,Inlaid In Black Plastic Shell,Can Adjust Diferent Mirror Angle. Full Angular Adjustment Our bike mirror is built to rotate 360 for maximum coverage. It's very easy to adjust to your desired angle as it can bent freely for what you want and hassle-free to install. Remember to fasten the screw after adjustment. Long Arm For Better Coverage The environmentally safe long arm made of Stainless steel ensures that better horizon is covered for a clear rear view. 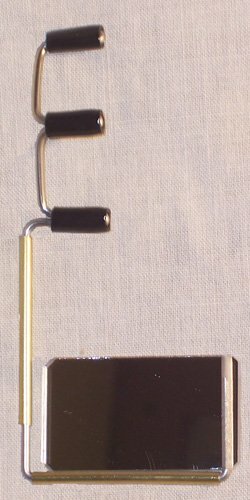 Mirror Support Tube, Plastic With Aluminum,Length 18cm,Diameter 1.1cm.The Install Tool included in the mirror package. Sturdy And Durable Comes with ABS optical frame and aluminum alloy which provide absolute protection to the mirror against breakage due to some slight bumps. We Can Use It For Mountain Road Bike Electric Bike or Motorcycle Handlebar .Remember Handlebar Size Diameter 22-27mm. 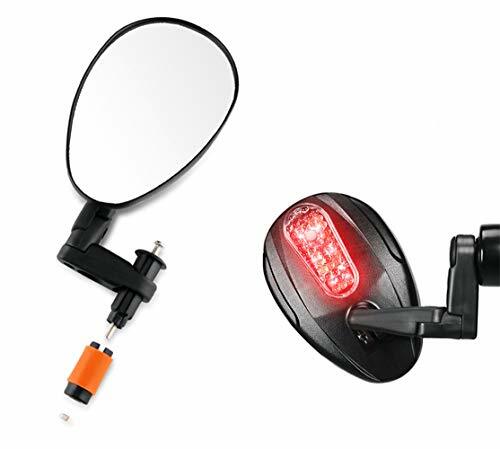 Order Risk Free We suggest you to buy this Bike Mirror with absolute peace of mind as we willing to take prompt responsibility of any Complaints and to refund you within 30 days of purchase. ALL Customer Can Return And Get Refunded In Case The Purchasing is Not Satisfiled for any reason ,You have no risk to try.